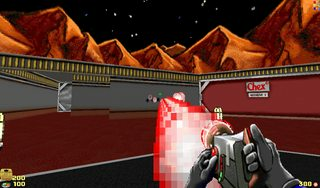 This is a mod i've been working on for some time, focusing on weapons with other small changes, it has been tested with Chex 3 but i don't think there would be any issue with the previous Chex games. -Bootspork has new sounds, but the behavior is kept the same. -Mini Zorcher, Large Zorcher, Phasing Zorcher, Zorch Propulsor and LAZ Device have smoother animations and new sounds. -Rapid Zorcher has wind up and wind down animations, uses the same sound as the Mini Zorcher. -all weapons now cast decals, hitscans cast puffs, Phasing Zorcher, Propulsor and LAZD projectiles are faster and nicer to look at, their offsets have been corrected. -UI sounds have been mostly changed to be less obnoxious when changing settings. -More weapons, still taking my time with this. Tested with GZDoom and ZDoom, probably works fine with Zandronum 3.0 builds. Screenies: Not many, current changes can't really be shown on screenies. 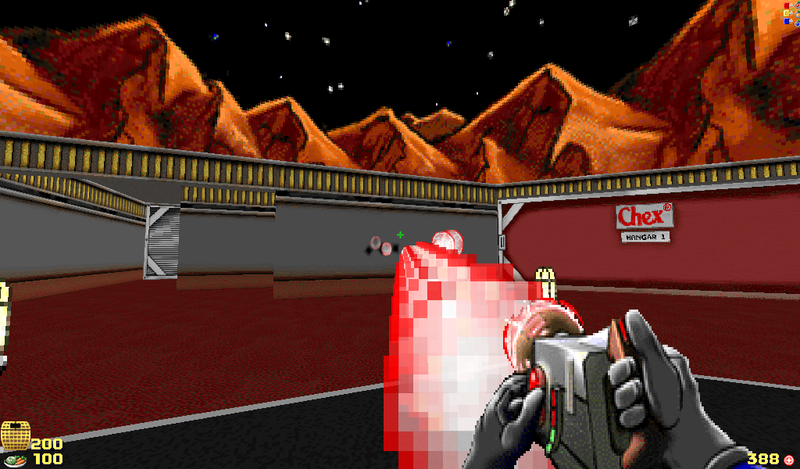 - The phasing zorcher projectiles are cool, I'd like to see some maps that are built around that weapon. I feel like it's a little underpowered, it might be worth increasing the power of the projectiles a little. - The LAZ device I'm a little more skeptical about, it looks cool but it's already a very powerful weapon and giving it a fast projectile on top of that seems like a little much. Side note: if you don't use A_FireBFG to fire the Laz Ball, you'll be able to use freelook with the BFG, which means that you'll be able to aim it at the floor or ceiling and decimate everything in front of you. It's somewhat important for single player and coop but this can make a huge difference for pvp game modes. - For the puff sprites, I would like to see a little more white in them to give them are more electrical sort of look to them. If you take a look at the flemoids getting zorched sprites, there's white veins of electricity in the zorch effect, that might help them fit in a little better with the other projectile explosion sprites. Also, maybe have the puff animations end differently? The smoke is fine but some kind of particle fizz out effect or burst effect might be interesting (sort of like the LAZ or plasma ball "explosion", but smaller, maybe?). - The kickback on the zorchers looks a little silly to me, sort of like a remote control having kickback. - I think the new sounds are well made but I think they're a little less distinctive than the original sounds, IMO they don't fit into Chex as well as the originals. - The bootspork sound is too quiet and it sounds sort of like a gas hedge trimmer. Maybe try speeding up the sound or changing the pitch? I'm looking forward to see what you come up with for custom weapons/alt fires, it would be really cool to see more Chex weapon mods, good luck with the project! -The Phasing Zorcher Projectiles already kinda do more damage than vanilla, but i can increase further. -I made the LAZDevice Projectile faster because at default speed it didn't really feel in tune with the sound, i am actually using A_FireCustomMissile("FastLAZBall") for it, unless you mean that i should use it instead. -I agree with the puffs, i'm looking to add something more electrical to it. -I'm gonna change the kickback animations to something else, peraphs the hand and zorcher moving down a little with the button-pushing strength. 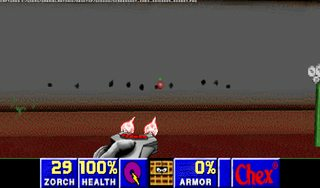 -The sounds are there mostly to make the weapons easier on the ears, most things in Chex sound really noisy to me, but i may make it an optional add-on. -I could go the Plasma Ball decal route, having a small black spot with a still of the projectile on top. -Bootspork sounds are definitely going out. i am actually using A_FireCustomMissile("FastLAZBall") for it, unless you mean that i should use it instead. A_FireCustomMissile will have the freeaim problem, but what you can do instead is have your projectile replace BFGBall, then use A_FireBFG to shoot the projectile. Updated the file, custom sounds for weapons have been removed, LAZ Device now uses A_FireBFG to fire its missile, minor changes regarding weapon orders and added unique obituaries to each weapon. - I like your idea for the puffs a lot, but there's something that looks a little odd about them to me, they might be a little bit too big, and they might be a little too white? Maybe play around with the alpha of the puff actor in DECORATE and see if they look better with transparency? - Recoloring the explosion decals to pink was an improvement but it also sort of looks like somebody went around sticking chewing gum to the walls; I'm still not really sure what to suggest as an alternative, but maybe something that's not quite so puffy looking? Maybe something more spark shaped? -The puffs came from Strife's teleportfog sprites, they are a little too big so i used the scale property in decorate, i'll have to test different scale and rendertype values. -I'll take a look at some Hexen decals, those may fit a little better. -The animation can be fixed easily thanks to Textures.txt lump. I've been thinking, but i can't come up with alt-fires for the weapons at all. Added V2 version, with prettier effects and spanish strings, among a few other things i don't remember, if you don't want the fancy projectiles then you can download v1. Upcoming monster update will be a separate pk3. Is there a mod that gets rid of the 1936 interface and gives back the 2020 interface? I hate the new interface a lot. Its all over the screen now instead of at the bottom. I tried to get use to it but i cant stand it so its unplayable.